Best POS Software for Retail | Designed for Growing Retailers. Best Point of Sale for Growing Retailers. Get the edge with a user-friendly Point of Sale with all the Retail Management features you need! Built by retailers, for retailers. We know your pain points. Springboard Retail cloud-based Point of Sale was designed from the ground up to provide enterprise-grade features for growing omnichannel retailers. 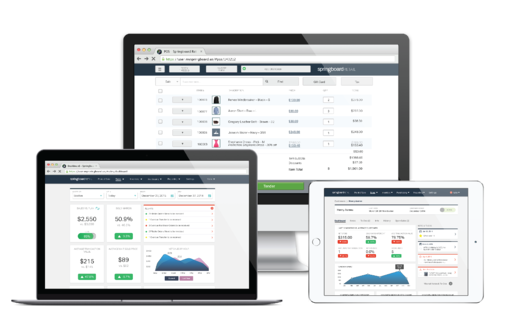 Inventory management, purchase & receiving, robust reporting and so much more – accessible from anywhere, anytime. Plus, save time and money with no user & maintenance fees, no licenses or upgrades. Springboard Retail Point of Sale supports retail mobility with a modern web-based approach. You get real-time data in a fast, intuitive and user friendly platform accessible anytime, anywhere! Easily import data from your previous POS including: items, inventory, customers, gift card and open POs. Upload this data as a .csv file, or use our data migration services. Choose what hardware is right for you –iPad, Mac or PC. Use your existing hardware, purchase new hardware from anywhere you’d like, or take advantage of our POS Portal bundle. Grow with a powerful Retail Management platform. "I wasn’t looking for a new POS system, but I’m so thankful that I found Springboard Retail. The team is fantastic and the transition from our old POS was super simple! Collect the data you need with our custom SmartFields. Create custom reports and gather valuable insight. Get a holistic enterprise view with cross-channel visibility. Share POS data using our top retail integrations. Want to spend a few minutes learning about the best POS software for retail? Transition at your pace, on your schedule. We’ll help you create a go-live plan, and you can be live in less than a week with our QuickStart package. Our customer success team will help you with configuration and train your employees to ensure a successful launch.